One of the most important things in classification writing is to get the right or best groups or categories. Once you do this, your ideas usually fall into place. Below are some helpful exercises for brainstorming, outlining, planning and writing classification sentences, paragraphs and essays. 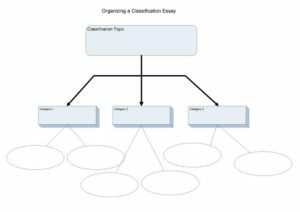 This is a pre-writing or introductory exercise for a classification paragraph or essay. 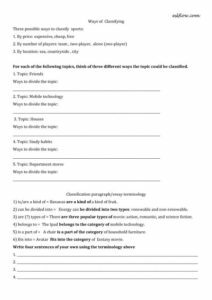 Students use their own ideas and try to divide each of the topics on the worksheet into 3 categories. Then they practice writing sentences to express their classifications on the next page. Click on the image below or the link to download the printable PDF file. 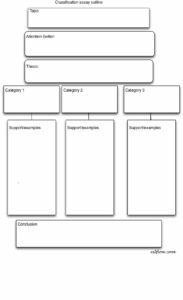 This is a graphic organizer for a classification paragraph or essay. It is a great way to organize ideas and think clearly about a topic. This is another pre-writing or introductory exercise for a classification paragraph or essay. Students try to divide each of the topics on the worksheet into 3 categories. Then write topic sentences for 4 of the topics. lesson about friendship or relationships. 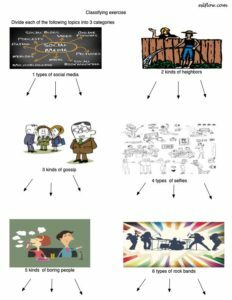 Students use the pictures to divide friends into 3 categories. For example, you might classify your friends into the categories of funny, generous and weird or outgoing, fashionable and introverted. Then, under each category title they give examples of the behavior of each category. 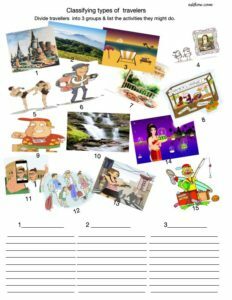 This is similar to the exercise above but the topic is travelers. Students try to divide travelers into 3 categories and list the things they do. You might classify travelers into categories such as: 1 adventure loving, 2 luxury loving and 3 culture loving or 1 beach tourists 2 mountain tourists and 3 city tourists. There are so many ways to do this. This is an alternative topic to the above exercises. Students try to divide roommates into 3 categories and list the things they do. Roommates could be divided into groups such as 1 lazy, 2 funny and 3 diligent or 1 helpful, 2 unhelpful and 3 bossy.